Nintendo and Sony stocks took a hit following Google's unveiling of Stadia, its game streaming platform—but one analyst says the markets are overreacting to the news. An L.A. startup wants to break up the SAT and ACT monopoly with a game they say accurately gauges critical thinking. And Engadget acknowledges that AIs are better gamers than us, but that's okay. I recently started playing 911 Operator, a simulation game released in early 2017, which allows you to take on the role of a 911 operator. In the game, you are responsible for answering emergency calls and dispatching emergency services. There is an interesting career mode where you progress through multiple cities, encountering an earthquake and a bomber along the way. Additionally, there is a freeplay mode with which you can download a map of any city! It is very fun to dispatch services to locations you actually know in the real world. A sequel, 112 Operator, is being released in early 2020. Guess who’s still on a Breath of the Wild kick? This girl! Guess who’s still ignoring the boxes in her new place, stragglers yet to be unpacked from the recent move? This girl! At this point, I have nothing left to do in the game rather than find every location and Korok (already beaten it, already done all the quests, already finished the DLC, already listened to the soundtrack a thousand times) but it’s a spot of calm familiarity in the chaos of moving. Sometimes you just need to put on a stupid Korok mask and wander Hyrule looking for the little buggers. Apparently, though, the video game isn’t enough for me, so I’ve started messing around with real-life prop creation. I was ambitious with my first choice (recently finished creating a light-up Sheikah Slate—it’s rough as all get out, but for Baby’s First Prop I’m proud of it) but I’m going to mellow out a bit for my next project. If you guessed that it would also be from Breath of the Wild, you’re right. Please send positive vibes to my poor fiancee, who has to deal with hearing the soundtrack over and over again from both the Switch (when I’m playing) and the front room (when I’m crafting). I definitely know what I wish I was playing: Sekiro: Shadows Die Twice. Having played the notoriously hard Bloodborne I am quietly praying for an 'easy' setting whilst watching the tantalizing gameplay footage appearing on YouTube. What I've actually been playing won't be as exciting to many seeing as it had a 2015 release date however I have been very excited to play it (especially as I caught a PlayStation store sale and paid less than £8 for it): The Witcher 3: Wild Hunt. I'm definitely enjoying this engrossing game however I do wish Geralt was a bit easier to control. He seems to always be in a rush to get everywhere which can make simple things like turning in the right direction to loot a fallen enemy somewhat trickier than it need be. Still, having spent £8 to play this game I don't think I have the right to complain really. Having bought my PlayStation 4 at the end of last year I've had quite a few happy buying experiences such as this. It was the first time I bought a console so late in its life cycle but needless to say I am very happy I did so. In fact, my PlayStation 4 was a first for me in more than one way: it was the first time I bought a console outside of the Nintendo family. I had some reservations however not only did I instantly fall in love with many of its exclusives but having bought it so late in its cycle I was able to buy many of those same exclusives for a fraction of their original prices too. And in terms of the near future, 2019 is shaping up to be an exciting year for both the Switch and the PlayStation 4. Sekiro is almost upon us, Cyberpunk 2077 looks beyond cool and I'm always front and center for any Zelda releases be they brand new or remakes. Have you ever heard the expression that you should never judge a person before walking a mile in their shoes? I guess I was like that with the despots, dictators, and all forms of malignant, power-hungry bad guys I've had to deal with in games for all of these years. Have I ever killed any of them? Yes, but they were all bad! (to borrow a phrase from The Arnold) At the time, I am sure that whacking them felt like, and was, the right and honorable thing to do, but now I'm not so sure. Granted, I have yet to walk a full metaphorical mile (or 'FMM' for the TLA lovin' crowd) in the role of Supreme Ruler, but the 100 yards or so that I have done are beginning to change my mind about the pressures and challenges of being the Grand Poobah. It all began when I landed on the pristine beach of Tropico 6. It's early days yet, and the lifestyle is still Easy Mode, but I am already finding the boss job to be mostly just dealing with an endless flood of people wanting/demanding things, half a dozen different cliques/tribes/Olympic Bingo teams that only care about their particular wants/needs, and arrogant imperial nattering functionaries with vastly inflated opinions of their power over me and my loyal citizens/subjects. I just hope I unlock the 'Assassinate' perk soon - I'm keeping a list. One the console, I have come to grips with The Golf Club 2. Just one short week ago I was observing/whining about the almost comical difficulties with approach shots and putting, both of which are extremely difficult because of the glass-smooth greens and exaggerated topology around the greens. As an aside, I must note that I use TGC2 in the same way I use a racing title: I play a few rounds on a simulated real world golf course that is hosting a tournament over the weekend in the same way I drive some laps at whatever track Formula 1 will be racing at. It has been TPC Sawgrass for a couple of weeks, and it has been an adventure in various flavors of impotent rage. I thought for sure that it all must be deliberately savage physics intended to make it seem more real. Well, after watching Pro after Pro after Pro deal with exactly the same issues and miss every bit as many short putts was an epiphany: the game is spot on! Sawgrass in real life is every bit the obnoxious little punk the virtual version is! After a few weeks of soaring above Bastion and watching loading screens my time with Anthem is over for a bit. There is some BioWare magic in the game but it's buried under technical issues and odd gameplay decisions. The flying mechanics are great but why add a heat mechanic to limit flying? As a MechWarrior Online veteran I'm used to mitigating heat but it just feels out of place in Anthem. You've designed an amazingly world that has lots of vertical space to explore—why force odd mechanics into how people can explore it? There are some decent moments in the game but they are ruined by long loading sequences and as the game transitions from game mode to a cut scene and back. Hopefully the sales of the game give BioWare the runway they to a place where it needs to be but that's going to take a few months to do. To fill the space I've started on The Division 2. I'm still getting past where I was in the beta but you can tell that Ubi listened to the feedback from the beta. The odd audio issues I had in the beta have been vanquished and everything has a good "feel" to it. The only negative I've seen so far is that the enemy AI ranges from "Let's go play in traffic" to SHODAN. Hopefully this evens out a bit as you progress past the early stages of the game but otherwise I'm having a lot of fun so far. 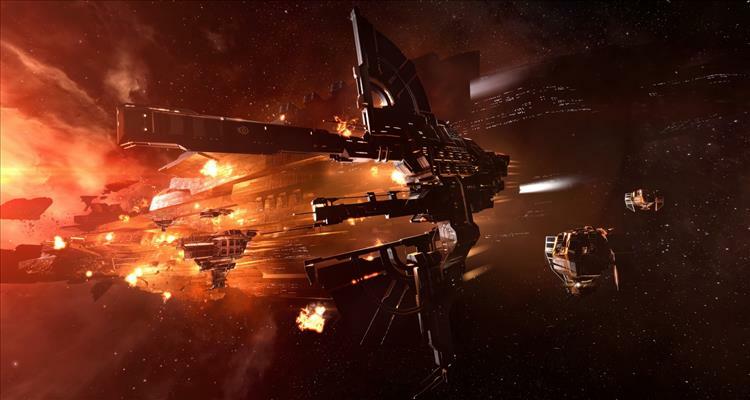 My on-again, off-again relationship with EVE Online is, well, on again. At some point almost every year I manage to get it downloaded. Sometimes I'm in for a few months. Sometimes I'm in for only a few hours. Then I'm out. That's what my last 13 years with this MMO spaceship spreadsheet has looked like. Both of us seem happy enough on the outside to keep this abusive relationship going. Stockholm syndrome, etc. Stardew Valley on my phone has been pretty neat. Farming on my phone is where I've always wanted to be farming. Look at me, I'm on my phone right now, here at work, watering a row of parsnips. Working through lunch? No problem. This is also me trying to fish a.k.a. relax, even though I can't seem to catch anything on this touchscreen. I'm also going to throw that broken CD into the dumpster sitting next to my house so Pelican Town's shop owner, Pierre, can visit during the night, grab them for resale, and leave me some cash. That's...actually a totally normal thing that happens in Stardew Valley. And I see you, Dawn of Man. I was scared to death that you were going to freeze me out during my first winter, or deplete my food stocks before spring, or have mountain lions wipe out my tribe in the summer. But you didn't do any of those things. So now I'm sadly less interested in playing you at the moment. Who knew that life in the Paleolithic would be...too easy? I’m still picking through Assassin’s Creed Odyssey, employing a deliberate approach and taking in every detail and side quest. By the time I’m through, I’ll have put a scary amount of hours into it.